McDonald’s has tried out several initiatives in the past year or so in the hopes of drawing in more customers. The company has experimented with opening its breakfast menu all day, using fresh ground beef for its burgers in select markets, creating a breakfast happy meal, and installing smart menu boards and other modern conveniences. 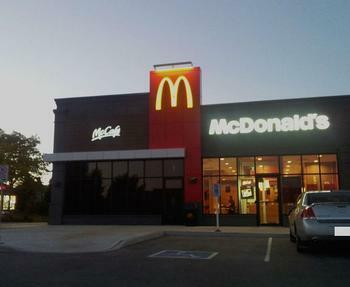 Despite all that, though, the Golden Arches and the rest of the fast food industry continues to show anemic growth. However, not to be deterred, McDonald’s is now offering a new deal to once again attract consumers. Bloomberg reports that the chain will be offering discounts on beverage options nationwide. Starting in April, customers will be able to buy a soda of any size for $1 and any McCafe specialty drink for $2. Adam Salgado, McDonald’s Vice President of U.S. marketing, says the deal will add “another layer of great value for customers with more choices,” and will appeal to those who are looking for a good deal. “We know that there are budget-conscious consumers out there. Value will always be a part of our strategy,” he said. Analysts have pointed out that maximizing revenue on drinks could be a smart move to help the bottom line, since drinks generally have higher profit margins than food items. However, customers in some markets will be able to take advantage of some noticeable price changes resulting from the decision. For example, Bloomberg points out that customers in Chicago may save over a dollar on certain McCafe frappes. Though the move is meant to attract more customers, analysts point out that demand for fast food has been pretty weak lately. McDonald’s led the industry last year and increased its revenue by 2.4%, but experts expect that number to decline to 1.5% this year.